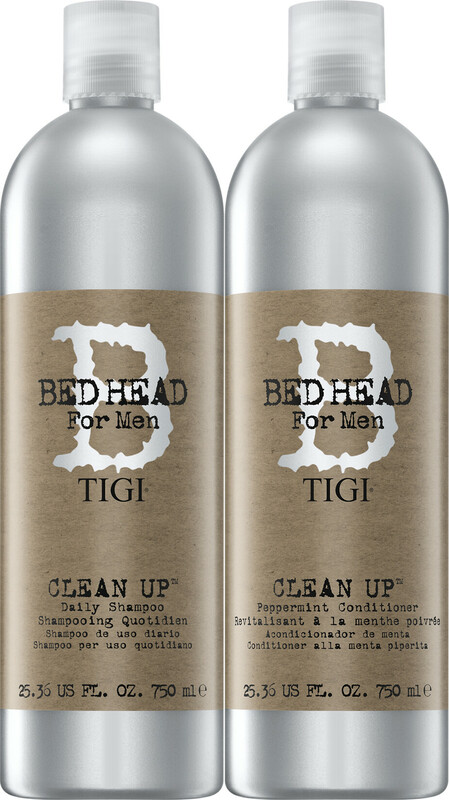 TIGI Bed Head for Men Clean Up Peppermint Conditioner 750ml. WHO: Guys who want healthy hair and scalp. WHAT: Conditions, strengthens and stimulates. WHY: Ginseng root extract, proteins and natural peppermint promote healthy scalp and hair growth with environmental protectants. HOW: Massage thoroughly into hair & scalp and rinse. TIGI Beadhead for Men Clean Up Shampoo 750ml. WHAT: Cleans hair, invigorates scalp. WHY: Sunflower seed, saw palmetto & lemongrass extracts along with menthol contribute to healthy hair growth. HOW: Lather up, massage into hair & scalp to promote healthy hair growth and rinse.